School districts are experiencing increased demands on their networks, infrastructure, and personnel at a time of budget constraints. IT directors must manage this growing phenomenon of too much IT stuff without enough staff. New technologies promise transformation of operational systems and educational processes, and many districts have discovered that software as a service (SaaS) – also known as applications that are "in the cloud", web-based, online, or on-demand-is a way to save time and money and improve services. 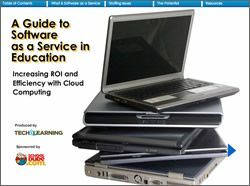 This eBook will detail the benefits of SaaS and explain the details of why schools should consider SaaS to increase their technology return on investment, decrease the total cost of technology ownership, and improve operational efficiency.